Fiddlehead: This Fern Is For Eating Just after the snow melts but long before the last frost, hardy New Englanders take to moist meadows and muddy riverbanks in search of the fiddlehead fern. It looks like the scrolled top of a violin and tastes a little like asparagus. 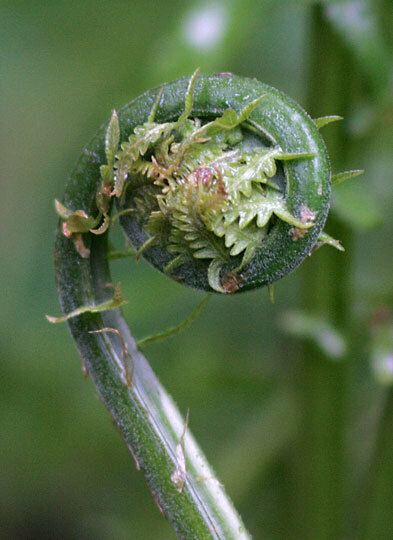 A fiddlehead fern in Vermont. 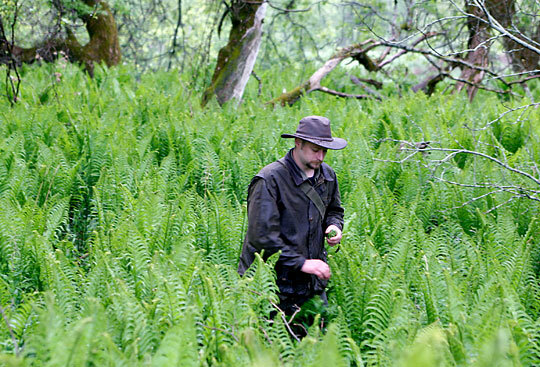 Ryan O'Malley, chef at Elements Food and Spirit in St. Johnsbury, Vt., walks through a field of ostrich ferns in search of fiddleheads, the furled baby ferns he serves at the restaurant. 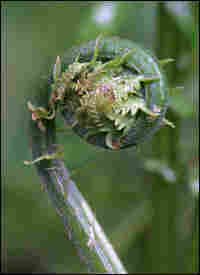 Want to know more about fiddleheads? Here, the basics on stalking and storage. 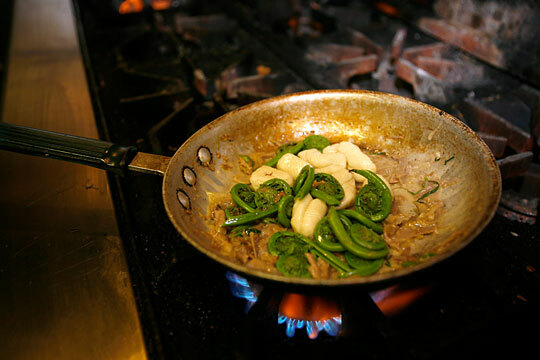 A dish made of fiddlehead ferns, duck confit and pasta is prepared by O'Malley. This is the first in a series of stories about farm fresh foods. Start thinking about what fills your shopping bag after a visit to your local farmers market, and plan on submitting your favorite recipes. Just after the snow melts, but long before the last frost, hardy New Englanders take to moist meadows and muddy riverbanks in search of an early but fleeting sign of spring: the furled baby fern, or fiddlehead. It looks like the scrolled top of a violin and tastes a little like asparagus. You can find them now in Vermont. Chef Ryan O'Malley, of Elements Food and Spirit in St. Johnsbury, Vt., heads out on a raw, misty morning to harvest some. He finds a mother lode of fiddleheads in a rugged corner of the state called the "Northeast Kingdom." "Generally, what happens is [the shoots] grow up in the center of the patch and they mature spreading out, so often you can find concentric rings around the center of the patch that are just now offering up new shoots," O'Malley says. Fiddlehead pickers often learn from their elders how to spot the varieties that are safe to eat. Most amateur cooks just wash them well, boil them for about three minutes, splash them with butter and lemon, and serve them up as soon as possible after bringing them home. In his restaurant kitchen, though, O'Malley adds a few savory ingredients and a couple of additional steps for his mouthwatering recipe. "Well, it's a fiddlehead and cavatelli dish with duck confit. Nice little full-flavored dish, and when we put it on the menu we call it 'Duck and Fiddle,' " O'Malley says. 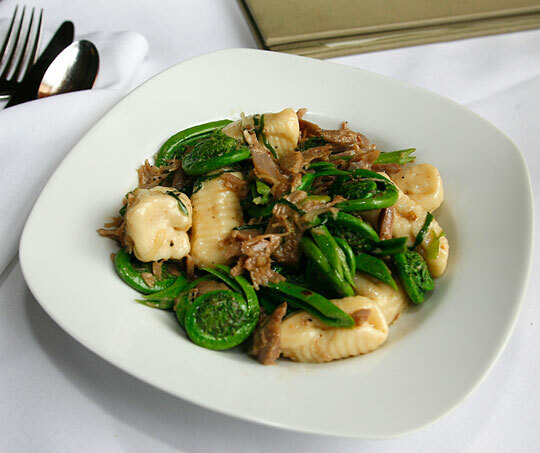 He quickly sautes the preserved duck with wild onions, bathes it with a buttery white wine sauce, and tosses in the parboiled, bite-sized pasta and the glistening green fiddleheads. After a few ambrosial bites, I call it investigative journalism. A dish containing fiddlehead ferns, duck confit and pasta prepared by Chef Ryan O'Malley at Elements Food and Spirit in St. Johnsbury, Vt. This dish is also known as "Duck and Fiddle." You may substitute good bacon or pancetta for the duck confit, garlic for the ramps and any fresh pasta for the cavatelli. Bring water to a brisk boil and drop in cavatelli and fiddleheads. Boil together for about 3 minutes. Meanwhile, brush saute pan with clarified butter. Saute ramps until translucent. Add shredded duck confit and toss with wooden spoon for a minute or so, then add wine to deglaze pan. Add chilled butter and reduce sauce until slightly thickened. Drain cavatelli and fiddleheads and add to saute pan. Add freshly ground black pepper to taste. Mix quickly, top with ramp greens, and serve in a shallow bowl. Recipe by Chef Ryan O'Malley of Elements Food and Spirit, St. Johnsbury, Vt. It has not been tested by NPR.